The Re-run of the u13/15 All-Ireland Championships took place yesterday in Lough Key. Le Cheile had two atheltes competing on the boys U13 Kildare Team . Conall Hayes and Darragh Nolan. They were accompained by their parents and I've been told that it was a very well organised event. The boys were out of the medals in the "A" race but Conall picked up a gold Team medal when the Kildare won the U13 "B" race. Also in action was Conor Murphy U17, Conor went out from the start and was in 2nd place with a lap to go, he was beaten in a sprint for the line and had to be content with 4th Place. This is out of age for Conor, unfortunately Conor was let down by his fellow Kildare Team as enough of them did not turn up to score. Congratulations on your individual medal. Next competition will be the Indoors on 27/28th February 2010 in Nenagh. Athletes in action are, Conor Murphy, Julie Boyle and Basit Enafie. Congratulations once again go to David McCarthy, David was runner up in the 800m National Indoor Championship held in the Odyssey Arena on Sunday. 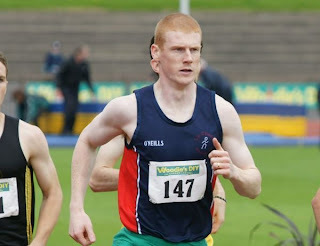 David has been selected to represent Ireland in the World Indoor Championships , a well deserved achievement. Other Kildare athletes were also in top form ; Claire Brady Celbridge AC who won Athlete of the meet along with securing her qualifily time for the World Indoor Championship along with a place on the Irish Team, Sandra Lawlor Celbridge AC 3rd hurdles and Claire Mooney of Naas AC who was 2nd in the 400m. Congratulations to Sean Flanagan, Fiachra McSuibhne and Conor Murphy who had great performances in the West Leinster Schools held on Thursday 4th Last. They now go forward to the Schools Leinster XC, Erica Dixon will also be competing. Best of luck to you all. Congratulations to David McCarthy (son of Richard) who achieved the qualifying time for the 800m World Indoor Championships. David was running in Vienna on Tuesday and his time was 1.48:29, a new P.B. David ran in Luxembourg a few days earlier and had a great win also. The news of David's achievement was greeted with delight during training on Tuesday. David McCarthy has represented Ireland on numerous occassions and David has a bronze World Indoor Championship medal for the 4 x 400m relay. David is a very dedicated and talented athlete and we wish him continued success. Well done David and the very best of luck to you and your family.